Tag line: "Outer space now belongs to 007"
Moonraker was the first Bond movie I ever saw on the big screen, and to be honest it bored me to tears. Going into it expecting to see space battles galore (thanks, in part, to the film’s ambitious ad campaign), the movie proved a major disappointment for this nine-year-old. Watching it again today, I still think Moonraker falls short of the mark, but at least this time around it managed to hold my attention. While on its way to England, A U.S. manufactured space shuttle is hijacked, then flown to an unknown location. In his effort to track it down, MI6’s James Bond (Roger Moore) travels to San Francisco, where he visits Drax Industries, the company that built the shuttle. When a talk with its owner, billionaire Hugo Drax (Michael Lonsdale), leaves 007 with more questions than answers, he delves into the matter a bit further, discovering along the way that a CIA operative named Holly Goodhead (Lois Chiles), who’s posing as an astronaut in training, is also searching for the lost shuttle. With the help of Drax’s personal assistant, Corrine Dufour (Corrine Clery), Bond uncovers information that leads him first to Venice, and then Rio de Janeiro, where he learns that Drax, who was most certainly behind the hijacking, has a scheme that, if successful, could result in mass murder on a global scale. As originally planned, 1977’s The Spy Who Loved Me was going to be followed by For Your Eyes Only. Hoping to capitalize on the Sci-Fi craze of the late ‘70s, producer Albert Broccoli instead switched things up by shoehorning Moonraker into the rotation, taking Bond someplace he’s never been before: Outer Space. Sure enough, the movie contains several nods to the era’s science fiction films, from laser rifles (a la Star Wars) to the keypad on a security door, which plays a tune anyone familiar with Close Encounters of the Third Kind will recognize immediately. In keeping with the spirit of these sci-fi offerings, Moonraker is effects heavy (a battle between dozens of U.S. astronauts and Drax’s cronies, set in the cold recesses of space, is well executed), and as set pieces go, Drax’s elaborate space station is among the best in the entire series. Moonraker also boasts some impressive gadgetry, with “Q” (Desmond Llewellyn) giving Bond such nifty items as an explosives-laced watch and a safe-cracking device that employs X-ray technology to get the job done. Bond is even presented with not one, but two special-issue boats, each with its own set of features. The first, disguised as a Gondola, is the weakest of the pair (Bond uses this to run from assassins chasing him through the canals of Venice, finally escaping when he transforms the Gondola into a car and drives away). The second boat, however, which 007 has with him in Rio, is equipped with mines, torpedoes, and a built-in hang glider (which, at a key moment, comes in handy). Aside from the epic battle in space, this particular boat chase is the movie’s best action sequence. Unfortunately, the film’s story plays second fiddle to the action and special effects. Bond’s investigation into Drax’s earth-bound activities seldom goes anywhere; while in Venice, 007 swings by a glass manufacturing plant (the name of which appeared on a blueprint in Drax’s office), only to do absolutely nothing once he gets there. The performances are also a problem. Marking his fourth turn as James Bond, Roger Moore was finally beginning to show his age (he was 51 when Moonraker was made) and as a result, the hand-to-hand fight scenes are flat and. at times, almost embarrassing to watch. Also lacking in energy are the two Bond girls: Holly Goodhead (the main squeeze) and Corrine Dufour (the sacrificial lamb), both of whom are pretty, but lifeless. Not even the villains are interesting. Michael Lonsdale seems bored as Drax, and his chief henchman in the first half of the film, a martial arts specialist named Chang (Toshirô Suga), feels like a leftover from You Only Live Twice. Only Richard Kiel’s Jaws, making his second appearance in a Bond picture (following The Spy Who Loved Me), comes across as truly menacing. As it was with my recent viewing of The Man with the Golden Gun, a second watch of Moonraker proved more entertaining than the first, but not quite entertaining enough to mask its flaws. 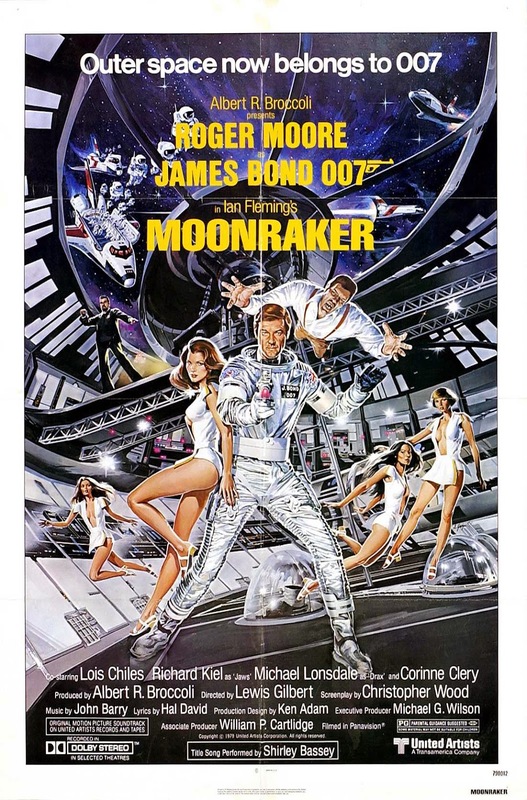 Like Golden Gun, Moonraker ranks as one of the weaker films in the series. Totally agree...Roger Moore's "Die Another Day" or Connery's "Diamonds Are Forever"...and Moore's "A View To A Kill" too!